The Stone House is the final book in the series of new Class novels. Although many people don't like this release, this is my favourite, despite the fact that it focuses on Tanya, my least favourite character from the television series. 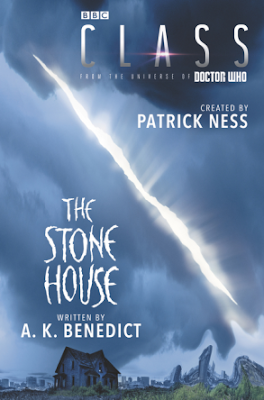 The Stone House was A.K. Benedict's contribution to the Class novel range. She picks up our sunny gang and manages to weave a clever plot around the fears and anxieties the surround the lives of teenagers. And there are plenty of fears and anxieties to go around! Charlie is the last survivor of a race from a dead planet and although he has Matteusz, the responsibility of being the last survivor and prince of a dead race weighs heavily on him. Then we have his bodyguard, Miss. Quill. She too is from Charlie's planet though she was on the opposing side of a war on their world. She is only protecting him because there is a creature in her head which will kill her if she doesn't protect the prince. April is currently sharing a heart with a ruthless alien murderer, the same murderer who sent his army to wipe out all life on Charlie's planet. Ram is simply suffering because no one should have to go through what he has been through as a teenager. So surely it is lucky that they all have Tanya? But she is two years younger than them and feels like an outsider in a group who are constantly at war with themselves. And that is no way to save the world. When the group finally agree to meet up and tackle the problem, it is between their silly squabbling that the house decides to make its move. Each of them gets to feel the power of the house, as they are plagued by destructive and emotional visions. But it soon becomes clear to them that the house is just getting started. The house wants more prisoners. And then there is a strange little website full of reported sightings of Faceless Alice, but these are just stories for the gullible and the media, aren't they? No. This house is haunted.